Every issue, landscape designer Darbi Davis digs deep to bring you stories for your outdoor space. This month: how to love your bugs. For desert dwellers, the bloody hell of summer is marked by songs of the cicada and a menagerie of insects ready to devour your monsoon bloomers and arid edibles. While insects are inevitable during this time, powders and potions in the form of pesticides are often unnecessary – and rid the good with the bad from the soil to the stems. Thankfully, Tucson is home to the University of Arizona’s Department of Entomology (host of the annual Arizona Insect Festival) and Arbico Organics, a natural pest control company where you can actually buy the good guys to release in your hard. Together they are an excellent resource for bad bug identification and good bug introduction. 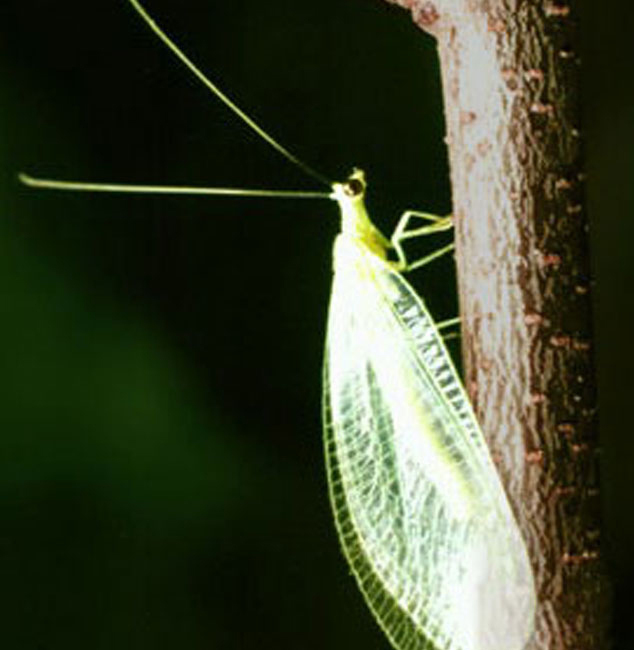 The Green Lacewing is a generalist and works wonders in our desert environment. It’s a lovely little winger in a psychedelic shade of lime green. Their eggs are found cantilevered off of a silken thread in an array resembling George Nelson’s Bubble Lamp or infamous Ball Clock. The eggs are stunning and tiny in their natural state, and hardly noticeable in their purchased state. Sprinkle them onto your infested plants and don’t wait for them to hatch. They will settle in your garden if there is enough food to sustain them across their lifecycle. Provide a plethora of pests and nectar (they are pollinators too) and the adults will swoon to the flicker of your patio light after sunset. Praying Mantis. Photo by Christian Meyn. 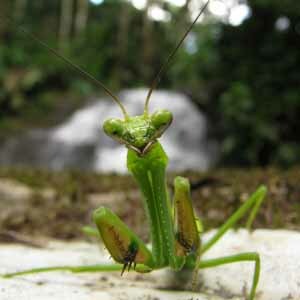 The Praying Mantis is a shady green rascal that enjoys the taste of bad garden bugs. However, if left unsatiated it eats the good bugs and tends towards cannibalism at all stages of life. Its eggs are encased in a lofty brown shell resembling a teeny tiny hardened burlap sack – not nearly as chic as the eggs of the Green Lacewing. 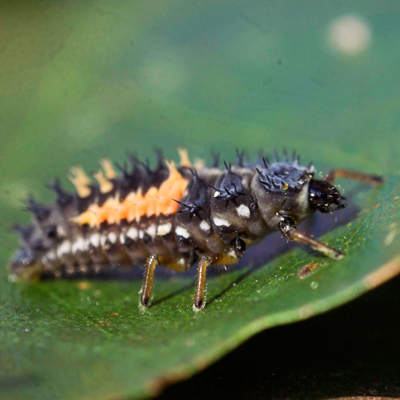 Once hatched, their voracious appetite drives them to eat a variety of bugs that evolve with their life cycle. As nymphs they eat aphids. As adults they eat beetles. Their survival depends on a copious feast of insects. Anything less and they eat themselves! The Ladybird beetle, also known as the Ladybug, is another beneficial insect. Aphids are their first choice, but they do enjoy other soft-bodied insects. Similar to their pals noted above, they too consume the most during their “infant” stage of life; however, as adults their diet doesn’t shift, they simply eat at a reduced rate. Ladybugs are most useful during their life cycle when they look like a tiny reptile and nothing like the round, spotted, red-winged gems we are accustomed to. The goal is to make them so comfy in your garden that they meticulously lay little yellow eggs in a perfectly straight pattern along a leaf. By the time they reach adulthood and our summer heat sets in, they head for the cool of Mount Lemmon and Madera Canyon, where they play in the pollen for the summer. For this reason, it’s best to release them when our temperatures are moderate. As for Dr. Bessey, his own garden is completely ‘au naturel’ when it comes to bugs. He refrains from using pesticides or chemicals, and advises using a high-pressure hose if pests get to be too much. His advice? Live with it, and with the casualties. “Frankly, things are going to pretty much come to a balance. The pests are going to get some things,” he says. 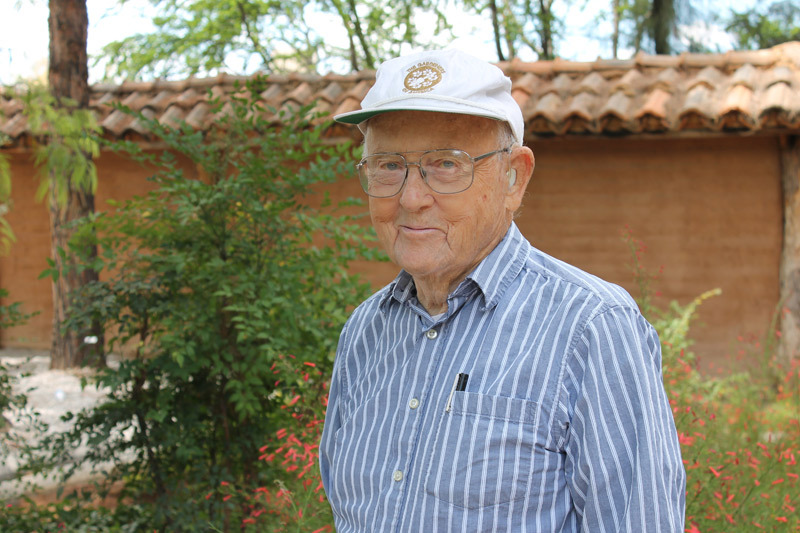 * Doctor Bessey will return to Tucson Botanical Gardens in September for a weekly plant clinic on Wednesdays. Find Arbico Organics and their ‘good guy’ bug supply at 10831 N. Mavinee Drive, Suite 185, Oro Valley, AZ. This lovely Tucson native is hardy and likes the sun. It produces tiny lavender flowers in the Spring and with the onset of the monsoons. The leaves are fuzzy and grayish-green. 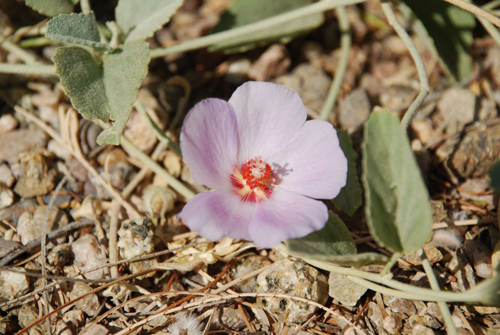 Rock Hibiscus, or Hibiscus denudatus, is a must-have in any native garden.